Come on, I wanted more dead bodies! Yes, I know I’m a sicko, but the description made THE REMOVERS sound fifty percent love-you-dad and fifty percent eww-that’s-gross. What I got was about ninety percent hug-fest and ten percent blood-bombs. The writing is good. For instance, visualize as you read this, “At the rec center baseball diamond across the street, screams of “Go!” follow an aluminum plink. At the corner, tulips in yellow, red, violet, planted to partition the sidewalk from a tiny row house lawn, salute a crew-cut man in a tank top, gold crucifix swinging as he soapy-sponges his four-wheeled stereo.” Beautiful painting of Americana, right? Just imagine how these words wrap around decayed dead bodies. Yeah, my thoughts exactly. I wanted more. 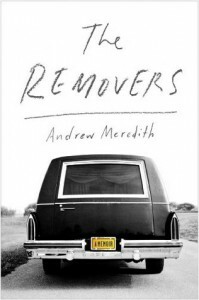 About dead bodies, this book is not for the squeamish. You’ll read as the author describes a three-week-old body that “feels like squeezing a Ziploc bag filled with tomato sauce.” Or, of the crematorium, “the smell of burning meat, or worse, boiling rivulets of body fat leaking out the front door of the machine, dripping down into the processing pan and onto the floor, leaving a grotesque cleanup task and an aromatic cocktail of chalk dust, basement mold, and the burnt black drippings in a roast pan.” Yummy. There’s maybe ten such descriptions in the whole book. That’s it. A majority of the book is kumbaya with the friends, family, and neighbors. That’s okay, I like that kind of stuff (even though I wanted a higher percentage of bodies). As you can see, the author is quite talented with words, but what drove me batty was his method of mashing topics together. One paragraph he’d be describing hoeing through body parts in the burner, the very next paragraph he’d continue a story about his father touching young college girls. Two totally different stories at once; tt was a blunt kick to the flow. There were a few quotes I liked that blended both blood and hugs together, such as, “What does it mean to reduce a woman to five pounds of powdered bone in one three-hundred-thousandth of the time she lived?” Profound. Overall, this was a well-written memoir with decent insight into the industry. The daddy stuff was nice, but a bit too long-winded for me. You’ll find enough bloody fascination buried within if you are willing to dig through the vast amount of touchy feely. Four stars because it was well written and interesting and at least lived up to some of its gross potential. Yes, there is a 500-pound woman and burning baby involved. Be forewarned. Thanks to Scribner for providing an electronic review copy of this for me.